Iran has aided and abetted the Assad dynasty since the 1979 revolution. The following is a timeline of its intervention in Syria's civil war since 2011. For a separate rundown of Iran’s military involvement and Israel’s response, click here. March 2011: Turkish authorities seized weapons from an Iranian cargo plane headed for Syria. The cargo, which was labeled “auto spare parts,” reportedly included automatic rifles, rocket launchers and mortars. Turkey informed the United Nations late March. The shipment violated a UN arms embargo. April 2011: The U.S. State Department accused Iran of assisting the Syrian regime’s repression of protestors. It said Iran provided gear, equipment and advice on monitoring and blocking protestors’ communication. Both Iran and Syria denied the allegation. At the end of the month, the Iranian Revolutionary Guard Corps (IRGC) was included in U.S. Treasury Department sanctions against individuals and organizations involved in human rights abuses in Syria. May 2011: The U.S. Treasury Department sanctioned IRGC Quds Force commander Qassem Soleimani and senior Quds Force officer Mohsen Chizari for their “complicity” in Syrian repression and human rights abuses. Soleimani was also described as the “conduit for Iranian material support” to the Syrian General Intelligence Directorate. The sanctions were announced after a leaked U.N. report found Iran was sending conventional weapons to Syria. “Most reported incidents of conventional arms-related violations” involved Syria, according to U.N. experts. June 2011: The U.S. Treasury Department sanctioned Iran’s Law Enforcement Forces (LEF) and designated two LEF leaders for providing support to the Assad regime. LEF deputy chief Ahmad Reza Radan met with Syrian security services in Damascus and provided “expertise to aid in the government’s crackdown on the Syrian people.” The LEF provided material support to the Syrian General Intelligence Directorate and sent personnel to Damascus to help suppress the Syrian uprising, the U.S. Treasury Department said. The designation came less than a week after the Treasury Department sanctioned Iran Air, Iran’s largest commercial air carrier, for shipping IRGC-related equipment, including missile and rocket components, to Syria. July 2011: Iran, Syria and Iraq signed a $10 billion agreement to construct a natural gas pipeline from Iranian fields to Iraq and Syria. Aug. 2011: Iran agreed to provide $23 million to build a new military base near Latakia airport in Syria. IRGC officers would be stationed at the new base to coordinate arms shipments with Syrian intelligence. Turkish authorities seized a truck carrying weapons from Iran headed for Syria near the Turkey-Syria border. Sept. 2011: Iranian President Mahmoud Ahmadinejad called for President Bashar al Assad to end his crackdown on Syrian protestors. Oct. 2011: The U.S. Treasury Department sanctioned Iran’s commercial airline Mahan Air for providing financial, material and technological support to the IRGC Qods Force. Mahan Air flew Qods Force personnel from Iran to Syria for military training, according to the designation. Dec. 2011: Iran and Syria signed a free trade agreement to relieve pressure from U.S., E.U. and some Arab League sanctions. Feb. 2012: The Syrian National Council, an opposition group, alleged that IRGC Qods Force commander Qassem Soleimani advised the Assad regime on suppressing protests. Qods Force personnel in Syria numbered in the high hundreds to low thousands range, according to Western and Arab diplomats and experts. March 2012: U.S. and European officials said Iran had helped Assad suppress protests with technological and weapon support. “Over the past year, Iran has provided security assistance to Damascus to help shore up Assad. Tehran during the last couple of months has been aiding the Syrian regime with lethal assistance - including rifles, ammunition, and other military equipment - to help it put down the opposition,” a U.S. official said. Iran had also supplied unarmed drones to the regime, the official added. May 2012: Ismail Ghaani, deputy head of the IRGC Qods Force, admitted Iran had a presence in Syria. “Before our presence in Syria, too many people were killed by the opposition but the physical and non-physical presence of the Islamic republic, big massacres in Syria were prevented,” he told the Iranian Students' News Agency. Aug. 2012: Hezbollah facilitated Syrian training by the IRGC Quds Force, according to a U.S. Treasury Department sanction announcement. “The IRGC-QF’s continued cooperation and coordination with Hezbollah has assisted the Syrian government’s efforts to violently crush opposition to Assad’s rule in Syria and highlights the combined Iranian and Syrian campaign to use their military resources and terrorist clients to inflict violence and suffering on the Syrian people and deny their legitimate democratic aspirations,” the designation stated. Sept. 2012: IRGC General Mohammad Ali Jafari confirmed that IRGC Qods Force personnel were in Syria helping the Assad regime. He, however, downplayed their involvement. “We have only given intellectual and advisory help and transferred experience,” Jafari claimed. “In comparison with the scale of support the Arab countries have given to opposition groups in Syria and their military presence, we haven’t taken any action there.” But Jafari threatened military action if Syria was attacked. Jafari’s statement came amid reports that Iran resumed military shipments to Syria over Iraqi airspace in July. Secretary of State Hillary Clinton received a commitment from Iraq’s foreign minister to inspect flights from Iran to Syria. Iranians allegedly provided a cargo plane to the Syrian military to move personnel and supplies around the country. A U.S. official also reported Iraqi Shiite militia fighters, backed by Iran, were traveling to Syria to help the Assad regime. Oct. 2012: Iran had provided surveillance and communications equipment and technical support to the Assad regime to track opposition forces, according to U.S. officials. Iran’s Ministry of Intelligence and Security was the primary technical assistant. Dec. 2012: Iraq remained a main supply route for Iranian weapons to Syria, including rockets, anti-tank missiles and rocket-propelled grenades and mortars. “We urge Iraq to be diligent and consistent in fulfilling its international obligations and commitments, either by continuing to require flights over Iraqi territory en route to Syria from Iran to land for inspection or by denying overflight requests for Iranian aircraft going to Syria,” a U.S. official said. Feb. 2013: President Assad and the Syrian opposition “should sit at the negotiating table to find a solution to the crisis, through mutual understanding,” Iranian President Ahmadinejad said at a press conference in Cairo. He also called for free elections in Syria. General Hassan Shateri, a senior commander in the IRGC, was reportedly assassinated traveling from Damascus to Beirut. Iran alleged that Israel was responsible for the assassination. "General Hassan Shateri was martyred by the agents and supporters of the Zionist regime on his way to Beirut from Damascus," IRGC spokesman Ramezan Sharif told Iranian media. March 2013: “Syria is the golden ring of resistance against Israel, and if it weren’t for Syria’s active government the country would become like Qatar or Kuwait. Iran is not prepared to lose this golden counterweight,” said Ali Akbar Velayati, senior foreign affairs adviser to Supreme Leader Ayatollah Ali Khamenei. Iran increased Syrian military support significantly with shipments through Lebanon, Turkey and Iraq, Western diplomats said. Secretary of State Kerry implored Iraqi Prime Minister Nuri al Maliki to take steps to stop Iranian shipments to Syria through Iraqi airspace. “I made very clear to the prime minister that the overflights from Iran are in fact helping to sustain President Assad and his regime,” Kerry said. May 2013: Israel hit two different Iranian missile shipments in Syria that were intended for Lebanese Hezbollah. On May 3, Israeli jets struck a convoy of Iranian Fateh-110 missiles that were destined for Lebanon. Two days later, in a pre-dawn attack, Israeli jets targeted an Iranian shipment of surface-to-surface missiles that Israel suspected was intended for Hezbollah. June 2013: Iran had spent between $600-700 million a month in Syrian aid, according to a senior Arab security source. July 2013: Iran gave Syria a $3.6 billion credit line to buy oil products and another $1 billion for non-oil products. Feb. 2014: Iran deployed senior commanders of the IRGC and its Qods Force to Syria to help the Assad regime, according to Iranian and Syrian sources and security experts. The deployed personnel assisted with intelligence gathering and training Syrian forces. May 2014: An IRGC commander admitted to training Syrian government forces and establishing a “second Hezbollah” in Syria, according to TIME. “Today we fight in Syria for interests such as the Islamic Revolution,” Hossein Hamedani, former commander of the IRGC Rasulollah division. Iran’s Fars News Agency originally reported Hamedani’s comments before taking down the post. Hamedani also claimed that Iran had 130,000 Basij paramilitary members trained and ready to go to Syria. Iran had also paid thousands of Afghan refugees to fight in Syria, according to Afghan and Western officials. The Islamic Republic reportedly offered a stipend of $500 a month and Iranian residency if refugees agreed to train and fight in Syria. Dec. 2014: Iranian President Hassan Rouhani reaffirmed the Islamic Republic’s support for Syria in a meeting with Syrian Foreign Minister Walid al Muallem. “We are certain that the Syrian nation will be the ultimate winner of this battle,” the president said. Iranian Vice President Eshaq Jahangiri echoed his sentiments in a separate meeting with Syrian Prime Minister Wael al Halqi a few days later. “Iran’s economic support for Syria will continue incessantly,” said Jahangiri. Syria reportedly requested a loan around $4 billion from Iran. Jan. 2015: Iranian general Mohammad Ali Allahdadi and six Hezbollah fighters were killed in an Israeli airstrike in the Syrian Golan Heights. The IRGC general was advising forces supporting the Assad regime. March 2015: Iranian Minister of Finance and Economic Affairs Ali Tayyeb-Nia visited Damascus and met with President Assad. Assad hailed Iran for its continued support and stressed the strategic importance their relationship. The Iranian minister later met with his Syrian counterpart, Ismail Ismail, and signed a memorandum of understanding that would allow Iran to participate in Syrian reconstruction efforts. 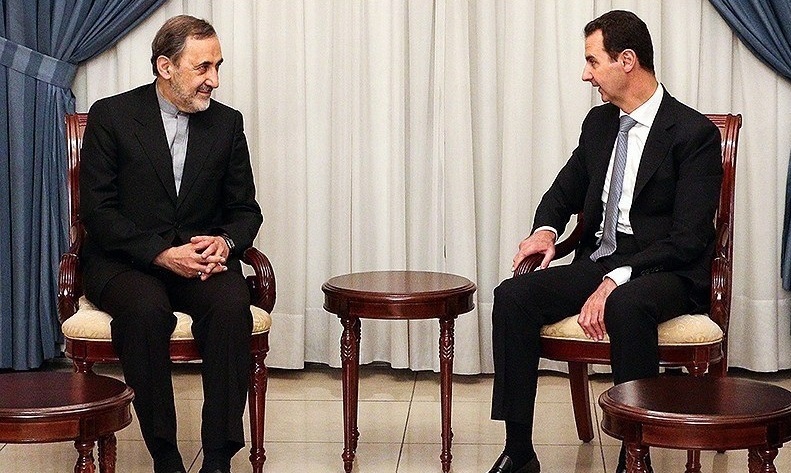 May 2015: Three Iranian officials traveled to Damascus, including a senior adviser to the supreme leader, Ali Akbar Velayati. He met with Assad and pledged support. “Iran is determined to continue to stand by Syria and supporting it with whatever is needed to reinforce the resistance its people are showing in defending the country and fighting terrorism,” he said. Another Iranian official reportedly signed an agreement ensuring a new credit line for Syria. June 2015: U.N. Special Envoy Staffan de Mistura estimated that Iran spends $6 billion a year to support the Assad regime. July 2015: Iran gave Syria a $1 billion credit to buy goods and fund projects. The agreement had been signed in May by the Syrian Commercial Bank and Export Development Bank of Iran. Sept. 2015: Iran, Syria, Russia and Iraq signed an intelligence-sharing agreement to help coordinate attacks against ISIS. Oct. 2015: Iran participated for the first time in Syrian peace talks in Vienna, Austria. At the peace dialogues, Iran supported a six-month Syrian transition period followed by elections. It clarified that it was not wedded to Assad. “Iran does not insist on keeping Assad in power forever,” said Iranian Deputy Foreign Minister and delegation member Amir Abdollahian. The Vienna talks occurred around the same time that Iran announced it was increasing its military presence in Syria. Iranian officers were providing tactical, operational and strategic assistance to Syrian commanders in battle, IRGC deputy commander Hossein Salami told Iranian media. He also confirmed that the Iranian casualties in Syria had increased. On October 8, IRGC Brigadier General Hossein Hamedani was killed by ISIS fighters outside Aleppo. Less than a week later, two IRGC colonels died in southern Syria. On October 22, Brigadier General Reza Khavari and seven other IRGC personnel died in clashes with Islamic State fighters in central Hama province. The U.S. Defense Intelligence Agency estimated that Iran had lost eight senior commanders in Syria since 2013. Chairman of the Joint Chiefs of Staff Gen. Joseph Dunford Jr. told U.S. Senators that Iran had “something less than 2,000” personnel in Syria. Nov. 2015: Iranian Foreign Minister Javad Zarif attended the Vienna talks with 19 other International Syria Support Group member states. The talks produced a peace plan for Syria, which included a January 1, 2016 target date for formal negotiations to start. At least 67 Iranians were killed in Syria since the beginning of October 2015, according to Iranian media reports. Dec. 2015: The UN Security Council endorsed the proposed Syrian peace plan which was formed at the Vienna talks in November. Iran began withdrawing IRGC forces from Syria, according to U.S. and Western military officials. Israeli sources said most IRGC personnel had been withdrawn less than a week after the initial drawback report. But the Iranian Foreign Ministry rejected the claims. “"The Islamic Republic of Iran's military advisors will continue presence in Syria to help the Syrian government with the war on terrorism," a foreign ministry official told Iranian Fars news agency. Jan. 2016: The IRGC had recruited thousands of undocumented Afghans living in Iran to fight in Syria since November 2013, Human Rights Watch reported. Feb. 2016: The International Syria Support Group met in Munich Germany and agreed to end hostilities in Syria within a week, begin delivering humanitarian aid and restart the previously suspended Geneva peace talks. The deal depended on Assad's agreement. May 2016: At least 17 Iranians were killed in a rebel attack on Khan Touman near Aleppo. It was the highest Iranian death toll outside of its borders since the Iran-Iraq war, according to Reuters. June 2016: Defense ministers from Iran, Russia and Syria met in Tehran to discuss ways to enhance military cooperation against terrorist groups in Syria. Aug. 2016: Iran permitted Russian planes to use its base near the Iranian city of Hamedan to bomb targets in three provinces in norther and eastern Syria. A high-ranking general was also killed in Syria at month’s end. IRGC Brigadier General Ahmad Ghulami was killed in clashes in Aleppo. Ghulami was reportedly in Syria training forces. Jan. 2017: Iran, Russia and Turkey sponsored the first round of Astana peace talks. The three sponsors agreed to form a trilateral monitoring body to enforce the Russia-Turkey ceasefire deal that went into effect on December 30, 2016. Opposition and government representatives sat down to negotiate, but neither side signed an agreement. Iran signed telecommunication and mining deals with Syria. Feb. 2017: Iran, Russia and Turkey held the second round of Syrian peace talks, known as Astana II. A document formalizing the trilateral ceasefire monitoring body was adopted. Opposition and government representatives agreed to find a mechanism to exchange corpses and prisoners. March 2017: Iran, Russia and Turkey held a third round of Syrian peace talks, but opposition delegates refused to attend and accused the Syrian government of failing to abide by the December ceasefire agreement. May 2017: At the fourth round of Astana peace talks, Russia, Iran and Turkey agreed to create four “de-escalation zones” in opposition-held territory. Representatives form the Syrian government and rebel groups did not agree to the proposal. Delegates from the opposition suspended their participation in the talks citing Syrian airstrikes on rebel territory. June 2017: Iran launched several ballistic missiles at ISIS targets in eastern Syria following two ISIS attacks in Tehran that killed 17 people. The Islamic Republic also reportedly established a drone airfield near a U.S. military base around Palmyra, Syria. The United States shot down two Iranian-made armed drones flying over Syria earlier in the month. July 2017: Delegates from Iran, Turkey and Russia met in Astana, Kazakhstan for a fifth round of Syrian peace negotiations. The parties discussed the previously agreed upon de-escalation zones but did not finalize the details for implementation. Aug. 2017: Israeli Prime Minister Benjamin Netanyahu accused Iran of building missile production sites in Syria and Lebanon at a meeting with U.N. Secretary General Antonio Guterres. Sept. 2017: President Hassan Rouhani attended the UN General Assembly meeting in New York City. Rouhani said Iran had been “constantly pursuing to hold dialogue and render aid based on the direct request of the nations and their legitimate governments.” The Islamic Republic rendered help and aid to the Syrian government based on that principle, he added. At the sixth round of Astana peace talks, Iran, Russia and Turkey agreed to establish de-escalation zones in Syria for a six-month period with the possibility to extend. The de-escalation areas would include parts of Eastern Ghouta and Idlib, Homs, Latakia, Aleppo and Hama provinces. Iran signed a memorandum of understanding with Syria’s electricity minister to repair Syrian power grids. The deal included building a power plant in the coastal province of Latakia and restoring the power grid’s main control center in Damascus. Iran signed two other contracts that would allow the Islamic Republic to supply power to Aleppo. Oct. 2017: The IRGC had recruited Afghan children as young as 14 years old fight in Syria, Human Rights Watch reported. Nov. 2017: Early in the month, BBC News reported Iran was building a permanent military base in Syria. The base was supposedly established at site used by the Syrian army about 8 miles south of Damascus, according to a Western intelligence official. On November 19, the Iranian, Russian and Turkish foreign ministers met in southern Turkey for closed-door talks. Russian Foreign Minister Sergei Lavrov said the talks were “very useful” and that the three countries “reached agreement on all the key issues,” but did not elaborate. Two days later, President Rouhani met with his Russian and Turkish counterparts Vladimir Putin and Recep Tayyip Erdogan in Sochi. “We are very pleased that the three countries, while emphasizing the territorial integrity, sovereignty, independence and unity of Syria, are committed to working closely to bring about peace and stability in Syria,” Rouhani told Putin and Erdogan. The three leaders agreed to bolster efforts to finish off “terrorist” groups in Syria, Putin said. They also committed to After the session, Putin said the three leaders agreed to bolster efforts to finish off “terrorist” groups in Syria. The presidents also committed to having their diplomats, security and defense institutions to work on finalizing the composition and date of the Syrian National Dialogue Congress. Dec. 2017: UN Special Envoy on Syria Staffan de Mistura participated in the eigth round of peace talks in Astana, Kazakhstan, sponsored by Iran, Russia and Turkey. At the conclusion of the talks, the sponsors announced they would hold a national dialogue congress in Sochi, Russia in January 2018 that would include "the participation of all segments of the Syrian society." Jan. 2018: Members of the Syrian parliament met with Iranian Foreign Minister Zarif and Senior Aide Ali Akbar Velayati in Tehran. Syrian Parliament Speaker Hamoudeh Sabbegh expressed his gratitude for Iranian support and indicated that Iran should play a large role in Syrian reconstruction. "Iran supported Syria in the most difficult and darkest days. This assistance and relations should continue in all fields and the reconstruction process should proceed in a way that Iran will be one of the main partners for the reconstruction of Syria," Sabbagh said. Feb. 2018: Israel shot down an Iranian drone that launched from Syria and flew into Israeli airspace, according to Israeli Defense Forces. Eight Israeli jets attacked Iranian targets in Syria about an hour later. One was hit by Syrian missiles, forcing the pilot and navigator to eject. March 2018: Foreign Ministers Javad Zarif, Sergei Lavrov and Mevlut Cavusoglu met in Astana, Kazakhstan to discuss the April summit involving the leaders of Iran, Russia and Turkey. In a join statement, the foreign ministers "reaffirmed their strong and continued commitment to the sovereignty and independence, unity and territorial integrity of the Syrian Arab Republic." April 2018: Iran, Russia and Turkey's heads of state met for a second time in Ankara, Turkey to discuss peace options for Syria. President's Rouhani, Putin and Erdogan agreed to continue cooperation in the fight against extremist groups in Syria. The leaders issued a joint statement at the conclusion of the meeting. "The three heads of state expressed their satisfaction in the outcomes of the first year of the Astana meetings held since January 2017, underlined that the Astana format had been the only effective international initiative that had helped reduce violence across Syria and had contributed to peace and stability in Syria, giving impetus to the Geneva process in order to find a lasting political solution to the Syrian conflict," the joint statement said. Israel allegedly launched an airstrike in Syria that killed at least 14 people, including seven Iranian military advisers. The attack targeted the T-4 airfield, which has been known to house Iranian drones. Mattisan Rowan, a program assistant at the U.S. Institute of Peace, contributed to this report.